significantly decreased the germination rates of stevia independently from the light treatments. Abdullateef, R.A., Osman, M., 2011. Effects of visible light wavelengths on seed germinability in Stevia rebaudiana Bertoni. International Journal of Biology, 3(4): 83-91. Andolfi, L., Macchia, M., Ceccarini, L., 2006. Agronomic-productive characteristics of two genotype of Stevia rebaudiana in Central Italy. Italian Journal of Agronomy, 1(2): 257-263. Başbağ, M., Toncer, O., Başbağ, S., 2009. Effects of different temperatures and duration on germination of caper (Capparis ovata) seeds. Journal of Environmental Biology, 30(4): 621-624. Das, K., Dang, R., Shivananda, T.N., 2008. Influence of bio-fertilizers on the availability of nutrients (N, P and K) in soil in relation to growth and yield of Stevia rebaudiana grown in South India. International Journal of Applied Research in Natural Products, 1(1): 20-24. Goettemoeller, J., Ching, A., 1999. Seed germination in Stevia rebaudiana. In: J. Janick (Ed), Perspectives on New Crops and New Uses, ASHS Press, Alexandria, VA., pp. 510-511. Handro, W., Ferreira, C.M., 1989. Stevia rebaudiana (Bert.) Bertoni: Production of natural sweeteners. Biotechnology in Agriculture and Forestry, 7: 468-487. Harrington, K.C., Southward, R.C., Kitchen, K.L., He, X.Z., 2011. 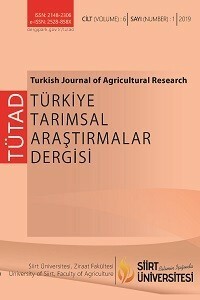 Investigation of herbicides tolerated by Stevia rebaudiana crops. New Zealand Journal of Crop and Horticultural Science, 39(1): 21-33. Kawatani, T., Kaneki, Y., Tanabe, T., 1976. The cultivation of kaa he-e (Stevia rebaudiana). II Seed germination with particular reference to the optimum temperature and light sensitivity. Japanese Journal of Tropical Agriculture, 20(3): 137-142. Kumar, R., Sharma, S., 2012. Effect of light and temperature on seed germination of important medicinal and aromatic plants in north western Himalayas. International Journal of Medicinal and Aromatic Plants, 2(3): 468-475. Macchia, M., Andolfi, L., Ceccarini, L., Angelini, L.G., 2007. Effects of temperature, light and pre-chilling on seed germination of Stevia rebaudiana (Bertoni) Bertoni Accessions. Italian Journal of Agronomy, 2(1): 55-62. Olivier, F.C., Annandale, J.G., 1998. Thermal time requirements for the development of green pea (Pisum sativum L.). Field Crops Research, 56(3): 301-307. Pourreza, J., Bahrani, A., 2012. Estimating cardinal temperatures of milk thistle (Sylibum marianum) seed germination. American-Eurasian Journal of Agricultural & Environmental Sciences, 12(11): 1485-1489. Roberts, E.H., 1988. Temperature and seed germination. In: S.P. Long, F.I. Woodward (Eds), Plants and temperature, Symposia of the Society of Experimental Biology, Cambridge, 42: 109-132. Sharma, M.L., 1976. Interaction of water potential and temperature effects on germination of three semi-arid plant species. Agronomy Journal, 68(2): 390-394. Takahashi, L., Melges, E., Carneiro, J.W.P., 1996. Germination performance of seeds of Stevia rebaudiana (Bert.) Bertoni under different temperatures. Revista Brasileira de Sementes, 18(1): 6-9. Taware, A.S., Harke, S.N., Mukadam, D.S., Chavan, A.M., Taware, S.D., 2010. Effect of different extracts of callus and plantlets of Stevia rebaudiana (Bertoni) on seed germination of some agricultural crops. African Journal of Biotechnology, 9(40): 6675-6683.